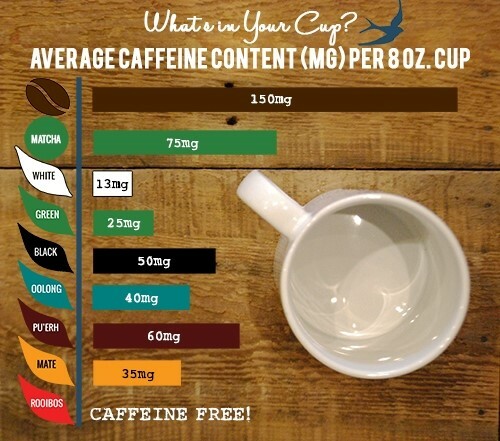 Home » Food & Drink » Does Tea Have More Caffeine than Coffee? There are quite a few myths and tales flying around about whether tea has more caffeine than coffee – so we hope to settle it here. As you can see from the caffeine infographic above when you compare a standard cup of tea to a standard cup of coffee, there is half the amount of caffeine in your cup of tea than coffee. BUT not all teas have the same caffeine content, white tea often has the least caffeine and matcha green tea powder the most. In addition, the the amount of caffeine which actually ends up in your body is influenced by lots of factors such as type of tea leaf (black, green, white etc. ), age of leaf, water temperature, steeping time and many others. So What is Caffeine ? The caffeine present in the leaves of the tea plant helps to kill all those pesky bugs that are trying to eat its lush leaves! Caffeine’s chemical formula is C8H10N4O2. It’s is a naturally occurring compound found in leaves and seeds such as tea and coffee that acts as a stimulant in humans and is a natural pesticide in plants. The caffeine present in the leaves of the tea plant helps to kill all those pesky bugs that are trying to eat its lush leaves! Historians track the first brewed tea to as far back as 2737 BC, whilst coffee was reportedly discovered by an Ethiopian goat herder called Kaldi in the year 850 AD. Kaldi noticed his goats got frisky after eating the coffee berries, he made a brew and the rest as they say is history. Today, 80% of the world’s population consumes a caffeinated product each day, and this number goes up to 90% for adults in North America. Check out our article on Coffee entitled Coffee – buzzy, frothy goodness.